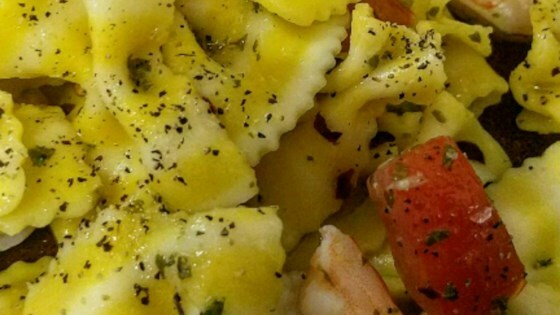 "Delicious shrimp in a wonderful lemon sauce." Bring a large pot of lightly salted water to a boil. Meanwhile prepare the remaining ingredients. In a large mixing bowl, combine the red pepper, shrimp, mint, lemon juice, lemon zest, olive oil, salt and pepper. Mix thoroughly. Add pasta to the boiling water and cook for 8 to 10 minutes or until al dente; drain. Add the pasta to the shrimp mixture and toss to coat well. Was better than I expected (I was desperate to make us of excess mint), but really screamed for some parmesan cheese, which I didn't have at the time. This was very good I added a clove of garlic to the sauce definately will make this again.